Throughout history a debate has raged concerning the proper timing of Yahweh’s Passover. Many observe the Passover on the 14th of the first month (Abib) and the Feast of Unleavened Bread on the 15th. Others believe that both the Passover and the first day of the Feast of Unleavened Bread are on the 14th. Still others observe the Passover and first day of the Feast on the 15th of Abib. Why so much confusion? It need not be. This study will harmonize both Old and New testaments to show that the two observances are clearly separate and distinct. Part of the error is historical. After Judah and Benjamin went into Babylonian exile by the hand of Nebuchadnezzar, these two Israelite tribes combined what is known in the Bible as the Passover and the first day of the Feast of Unleavened Bread. No one knows exactly when these two observances were combined, but what is known is that it happened during the Exile in Babylon. Israelites picked up a number of errors while under Babylonian influence, and the joining of Passover with the Feast was one of them. Because of this error some believe Passover is also the first high day of the Feast of Unleavened Bread. The Encyclopaedia Judaica confirms the mistake committed by these Jews: “The feast of Passover consists of two parts: The Passover ceremony and the Feast of Unleavened Bread. Originally, both parts existed separately; but at the beginning of the [Babylonian] exile they were combined,” Vol. 13, p. 169. The book, The Torah, by W. Gunther Plaunt, corroborates, saying, “The Passover and the Feast of Unleavened Bread rituals were originally two separate observances which were combined sometime between the events of the Exodus and the redaction of the text” (p. 445). Clearly, the Scriptures proclaim that the 14th of Abib marks the Passover memorial, while the 15th of Abib starts the Feast of Unleavened Bread. But two particular deviations from this truth exist. One is that the Passover is the first high Sabbath of the Feast of Unleavened Bread and falls on the 14th of Abib. The second is also that the Passover is the first high day of the Feast of Unleavened Bread, but occurs on the 15th of Abib. “[Yahweh’s] Passover begins at twilight on the fourteenth day of the first month. On the fifteenth day of that month [Yahweh’s] Feast of Unleavened Bread begins; for seven days you must eat bread made without yeast” (Lev. 23:5-6). “And in the fourteenth day of the first month is the Passover of [Yahweh]. And in the fifteenth day of this month is the feast: seven days shall unleavened bread be eaten” (Num. 28:16-17). Other translations are just as plain, including the KJV. Clearly, the Passover is on the 14th of Abib, while the Feast of Unleavened Bread begins on the 15th of Abib and advances through the 21st day of Abib, making a seven-day Feast. At least 10 clear distinctions separate the Passover from the high day or the first day of the Feast of Unleavened Bread that follows it. — “Afterward Moses and Aaron went to Pharaoh and said, This is what Yahweh, the Elohim of Israel, says: Let my people go, so that they may hold a festival to me in the desert” (Ex. 5:1). — “Then Pharaoh summoned Moses and Aaron and said, go, sacrifice to your Elohim here in the land. But Moses said, That would not be right. The sacrifices we offer Yahweh our Elohim would be detestable to the Egyptians. And if we offer sacrifices that are detestable in their eyes, will they not stone us?” (Ex. 8:25-26). Moses knew that holding the Feast of Unleavened Bread among the Egyptians would be disastrous. First, Yahweh prohibited it. Second, the Egyptians were notorious for animal worship. They held sacred some of the same animals that Israel was required to sacrifice during the Feast of Unleavened Bread. Moses realized this fact and knew that by sacrificing these animals that he would be signing his own death warrant. Among other animals, the Egyptians worshiped bulls and cows to the god Hathor. They even venerated crops to honor Osiris, the god of vegetation and maker of grain. No wonder Moses could not hold Yahweh’s Feast among them, with all of the daily animal and meal offerings that were required of Israel during the Feast. Moses told Pharaoh that it was not possible to hold a Feast at that location. Still, they kept the Passover there in Egypt. Yahweh had commanded Israel to hold a feast to Him in the wilderness, not among the Egyptians where they observed that Passover. How, then, could Passover be the first day of the Feast? 2 Another difference between the two observances is the characteristic mood of each. The Passover symbolizes a day of suffering and pain, while the Feast of Unleavened Bread is a time of joy. Let us detail these differences. Two major events contribute to the solemnity of Passover. First, Passover is the day that the death angel passed over Egypt destroying all firstborn of both man and beast. Second, this is the day that Yahshua our Savior was impaled on the torture stake for our sins. The Feast of Unleavened Bread is memorable for one great event. It is the day on which the Israelites were freed to leave and were no longer serving the Egyptians as slaves. Their harsh, brick-making days were over. 3 A third reason that Passover could not be a High Day is that there was only one sacrifice offered on Passover, while many sacrifices were commanded for the Feast days. Here is an unmistakable command for additional offering for all seven days of the Feast. Nowhere in the Bible do we find these sacrifices commanded or offered by Israel or any other people during the Passover. How could the Passover be the first day of the Feast, with no evidence of these other offerings given on the Passover? In addition, the unleavened bread on Passover specifically represents Yahshua’s sacrificed body given in death for us (Matt. 26:26). But the unleavened bread of the Feast has a different meaning. Paul writes in 1Corinthians 5:8 that the unleavened bread of the Feast stands for “sincerity and truth.” Confusing these by combining the two observances perverts the different purpose and design for these unleavened symbols. The Hebrew word for service is No. 5656, abodah in Strong’s Concordance, and is defined as “work of any kind.” How could the Passover be a Sabbath when the Hebrew word that depicts the Passover means to engage in work? Work is strictly prohibited on a Sabbath or Feast High Day. 5 A fifth and often overlooked criterion for Passover as a non-High Day is that the Passover is referred to as a Preparation day for the Feast in the New Testament. In Mark 15:42-43 Joseph of Arimathaea asks for the body of Yahshua the day before the first high Sabbath of the Feast of Unleavened Bread: “And when even was now come, because it was the preparation, that is, the day before the Sabbath, there came Joseph of Arimathaea, a councilor of honorable estate, who also himself was looking for the kingdom of [Elohim]; and he boldly went in unto Pilate, and asked for the body of [Yahshua]” (American Standard). Yahshua was impaled on the Passover, which is called the Preparation day, the day before the High Sabbath or the first High Day of the Feast. Joseph of Arimathaea knew that he had to remove Yahshua from the stake before sunset, which started the first High Sabbath of the Feast. Another passage that validates the Passover as a day of preparation is Luke 23:53-54. In this passage Joseph of Arimathaea removed the body of Yahshua from the stake and prepared it for burial: “And he took it down, and wrapped it in a linen cloth, and laid him in a tomb that was hewn in stone, where never man had yet lain. And it was the day of the Preparation, and the Sabbath drew on” (American Standard). Note the plain statement that the Passover was the Preparation day while the High Sabbath was yet to come. The Hebrew word for Preparation in Strong’s Greek Dictionary is No. 3904, paraskeue, “as if from No. 3903; meaning, to make ready or prepare one self.” The day of Preparation is the Preparation day for the Feast that follows the Passover. The Passover is a day to make ready for the Feast of Unleavened Bread by removing all leavening from one’s premises. Remember that Passover is also called a service, pertaining to work. “Drew on” is epiphosoko in the Greek and literally means “to begin to” or draw on toward.” The High Day was about to begin, not come to an end, after Yahshua was taken down and put in the tomb. If the women would not so much as visit the tomb on the weekly Sabbath (Luke 23:56-24:1), how could Joseph of Arimathaea, a Jewish follower of Yahshua, literally work to take the body down and prepare it for burial on a High Sabbath? 6 A sixth distinction that eliminates the Passover from a High Sabbath of the Feast is that the commandment of the Passover was only for the circumcised, while the Feast and Sabbaths were commanded for ALL in the household to observe, circumcised as well as uncircumcised. In Exodus 12:19 Yahweh commands all of Israel, including the uncircumcised stranger, to observe the Feast of Unleavened Bread: “For seven days no yeast is to be found in your houses. And whoever eats anything with yeast in it must be cut off from the community of Israel, whether he is an alien or native-born” (NIV). Yahweh says in Exodus 12:43, however, that no stranger or alien may partake of His Passover. All must be circumcised: “[Yahweh] said to Moses and Aaron, These are the regulations for the Passover: No foreigner is to eat of it” (NIV). 7 A seventh factor that clearly separates the Passover from a Sabbath or High Day is the strict prohibition against working on the Sabbaths. Yahweh commanded no work whatsoever be done on His Sabbath day. This command is the same for the High Days of the Feast in passages found in Exodus 12 and Leviticus 23. In Luke 23:26 Simon of Cyrene comes out of the country — a literal field — on Passover day. “And when they led him away, they laid hold upon one Simon of Cyrene, coming from the country, and laid on him the stake, to bear it after [Yahshua]” (American Standard). The Greek word for country in this passage is No. 68, agros. Strong’s defines agros as: “a field (as a drive for cattle): generally the country, spec. a farm, i.e. hamlet.” Incidentally, from agros we get our word agriculture. Here one of Yahshua’s own disciples comes out of the agros or field on Passover day, indicating that Simon was working in the fields on Passover day. Neither Simon nor any other disciple would have done this on a Sabbath or High Day because of the strict prohibition against work on a High Day. 8 An eighth factor witnessing against a High Day Passover is that no buying or selling is permitted on a High Day. When Israel returned to Jerusalem under Nehemiah, Nehemiah commanded them not to buy or sell on Yahweh’s Sabbath or Holy Day (Neh. 10:31): “When the neighboring peoples bring merchandise or grain to sell on the Sabbath, we will not buy from them on the Sabbath or on any holy day” (NIV). We see two key facts within this passage. One is that Yahshua’s disciples acknowledged that the Feast had not yet begun, therefore the statement, “to buy what was needed for the Feast.” Remember that this was the start of Passover night. The other fact is that Yahshua’s disciples thought that Yahshua gave the money to Judah Iscariot in order to purchase supplies. But that would violate the commandment not to buy or sell on a High Day or the Sabbath. Would Yahshua have prompted his own disciple to break Yahweh’s law if this Passover were a High Day? By His own instructions to Judah Yahshua shows that the Passover is neither Sabbath nor High Day. Nowhere does the Bible contain a prohibition against buying or selling on Passover. 9 A ninth fact is found in the Seder service held by the Jews today. The Jews hold a Seder on the 14th of Abib to commemorate the Passover meal. The Seder service consists of prescribed foods, each of which symbolizes some aspect of the first Passover in Egypt. For example, they partake of horseradish, which signifies the bitterness of the first Passover. They also eat a blend of chopped nuts and apples, which symbolizes the building mortar used by the Israelites in their slavery. Also during this memorial the account of Exodus is retold and prayers of thanksgiving are offered to Yahweh. The entire family always observes the Seder service together. What is interesting is that the Seder service is not a High Day service, but a memorial on the 14th, just as was the Passover. On the one hand the Jews today honor the 14th Passover by observing the Seder service as a memorial, but at the same time they hold Passover on the 15th of Abib. Clearly we see a blending of the true Passover on the 14th with a tradition of keeping the 15th Passover that emerged from their Babylonian captivity. — “When [Yahshua] had finished saying all these things, he said to his disciples, ‘As you know, the Passover is two days away — and the Son of Man will be handed over to be impaled.’ Then the chief priests and the elders of the people assembled in the palace of the high priest, whose name was Caiaphas, and they plotted to arrest [Yahshua] in some sly way and kill him. ‘But not during the Feast,’ they said, ‘or there may be a riot among the people’ ” (Matt. 26:1-5, NIV). — “Now the Passover and the Feast of Unleavened Bread were only two days away, and the chief priests and the teachers of the law were looking for some sly way to arrest [Yahshua] and kill him. ‘But not during the Feast,’ they said, ‘or the people may riot’” (Mark 14:1-2, NIV). The Jewish religious authorities were planning to take and kill Yahshua, but they knew that it would not be possible to do so on a Feast day, for that was against the Law of Moses. Therefore, they knew that He had to be taken and killed before the Feast. Instead, they accomplished their deeds on Passover itself, proving it was not a Feast High Sabbath. death of Yahshua under the renewed Covenant. Passover is a time of pain and suffering; the Feast is atime to joyfully celebrate freedom. Passover had only one sacrificial offering, while each dayof the Feast had many commanded sacrifices. The unleavened bread of the Passover service has dif-ferent meaning and significance from the unleavenedbread eaten each day of the Feast of Unleavened Bread. Work was done on the Passover; work was prohibitedon the High Days of the Feast of Unleavened Bread. Only the circumcised could observe Passover; all werecommanded to keep the Feast of Unleavened Bread. 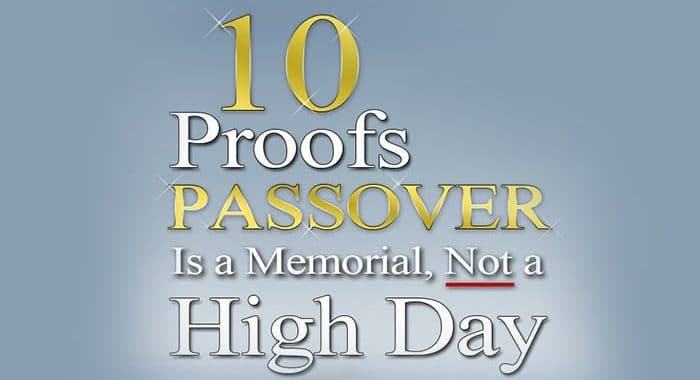 Passover is never called a High Day or Sabbath. Rather,it is called the Preparation day for the Feast. Commerce was done on Passover day; commerce wasprohibited on all Feast High Days. The Seder on the 14th is a throwback to the true Pass-over and is not a High Day. The Jewish leaders would not take and kill Yahshua on aHigh Day; but they did do so on the Passover. Our desire is to keep the Passover and Feast of Unleavened Bread properly as commanded in the Scriptures. If we take all the evidence into consideration, we are left with only one conclusion: Passover is on the 14th, the Feast of Unleavened begins with a High Day on the 15th. Posted in Biblical Feast Days, Booklets. ← Wine or Grape Juice for Passover?